Yesterday we were invited to go and test out the Aldi range of school uniform. This excellent value and superb quality Aldi uniform will be available in stores from July 23rd 2015, subject to availability and whilst stocks last. The Aldi school clothing range has lots included at great value prices in sizes 4-11 years plus plenty of school accessories will be available too. I know it seems slightly early to be talking about school uniform but we are already in June, although the weather today tells me otherwise! The Aldi event yesterday meant we could really put the school uniform through it's paces to see how well it withstands some play time. 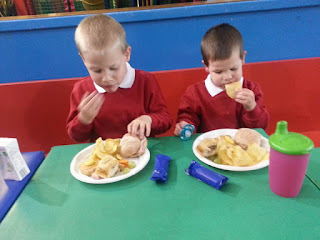 We met at a play area in London and Thing 4 and 5 were given there own set of school clothes to put on for the afternoon. Each set contained a polo shirt, trousers and a jumper. The clothes were very reasonably sized. Thing 4 is aged 5.5 yrs old but I have found myself buying him aged 7 school uniform recently. 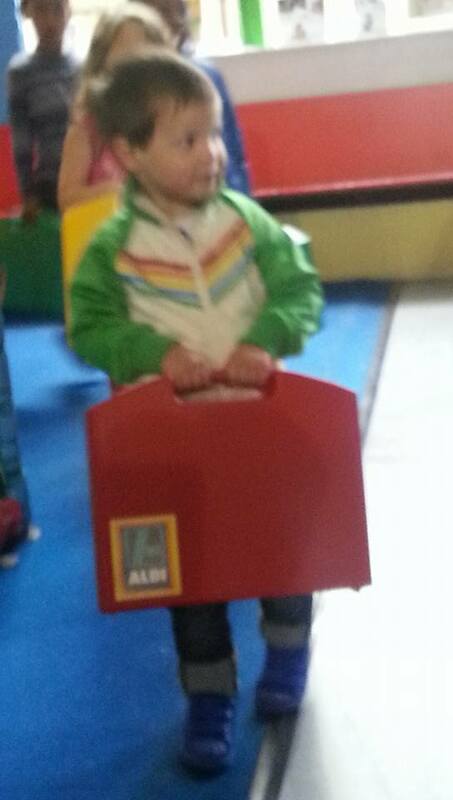 The age 6-7 Aldi trousers were plenty big enough in the leg with room for growing too. 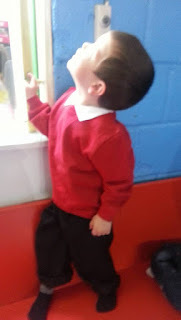 The children were sent off to play in the play area and they really put it to the test. There was plenty of climbing, running and jumping. Sliding around on knees and whizzing down the slide at high speed! They had great fun playing and the school uniform fared very well. The children were treated to some lovely tea too which put the school uniform through the 'school lunchtime' test too. I have to admit Thing 5 is one for wiping his hands on his jumper rather than washing them after lunch, ewww! However, this meant we really put the jumper through the grubby hands test. We washed all of the uniform when we got home and it washed really well. Thing 4 loved how soft the jumper felt inside and it has come out of the wash still lovely and soft. The Aldi school uniform range will cover ages 4-11 years and items available include trousers in grey, navy or black (£1.50), pleated skirt in grey, navy or black (£1.50). Boys and girls polo shirts in light blue or white (£1.25). Round neck sweaters in red or black (£1.50). For PE; They will have jogging bottoms (£2.99), PE shorts/Skort (£2.79), round neck t shirts (£1.99), plimsolls (£1.79) and children's trainers (£3.99). There will also be Aldi scuff resistant shoes (£6.99), children's padded jacket (£9.99) nd lunch bag and clips (£6.99) which will include all the children's favourite characters. With a wide range of Back to School accessories, stationary and much, much more, Aldi will have it covered for Back to School. Aldi school uniform hits Aldi stores from July 23rd 2015 subject to availability and whilst stocks last. With prices like these I can't see it hanging around for long!